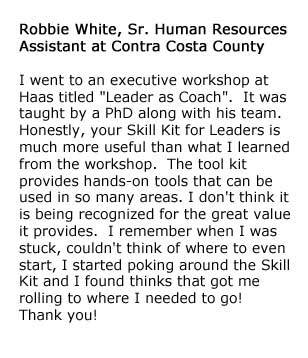 I went to an executive workshop at Haas titled “Leader as Coach”. It was taught by a PhD along with his team. Honestly, your Skill Kit for Leaders is much more useful than what I learned from the workshop. The tool kit provides hands-on tools that can be used in so many areas. I don’t think it is being recognized for the great value it provides. I remember when I was stuck, couldn’t think of where to even start, I started poking around the Skill Kit and I found thinks that got me rolling to where I needed to go! Thank you!